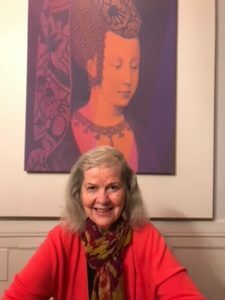 I had a dramatic breakthrough recently while I was touring the French countyside where I was struck by a picture my partner captured of me over dinner. The image behind me is one of the wives of the Dukes of Burgundy, her eyes lowered in submission. The juxtaposition of my image with hers stunned me. If we are going to change the world, it has to be to face it with a fierce resolve that says we are taking a stand for all women who have been abused. When we look in the mirror, let’s pause, not to fret about wrinkles, but to see the faces of the legends of women who are incredibly brave in proclaiming to themselves and others that we have every right to look at the world with boldness, loving who we are and what we are becoming. In the few days since the breakthrough, I have paused, seeing myself through new eyes. That simple perceptional shift will be my talisman as I continue with a new commitment on my redemptive path with other thrivers. This entry was posted in Dramatic Breakthroughs, Redemptive Paths. Fierce resolve in supporting women that have experienced sexual abuse is critical. More than ever, we hear from women who only now are able to even talk about their sexual abuse. The age range when these individuals can finally face their trauma and pain can be vast. Efforts need to increase in helping those who survive to become thrivers, to reclaim their lives, dignity, and well being. It can happen with appropriate support from professionals that use all the tools available to them to repair damaged lives. Friends and family are also important in supporting and nurturing sexually abused girls and women.